Tony and Ted used to play together in a band called "The Moondogs" After writing some Christian music together, the 2 of us decided that we needed to focus our musical abilities on God. Leaving the "Moondogs" was a difficult decision. We were close to the other members of the band, and we truly enjoyed writing music with them. However we both knew that God was challenging us to write music for him, and him only. Which leads us here. 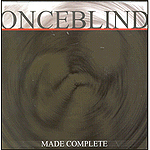 "Once blind" has a full CD plus of music, and is in the process of putting together a full band. We are hoping to be out playing whatever events will have us by mid Summer 2008.